One way I like to try and make a difference is supporting sustainable companies that I can feel good about. There are two ways to do this, one is by buying their products, the other is by investing in their future and showing your support and investing in their future. The second way also leaves you an opportunity to benefit from the success of that company. I try and keep an eye out for new and sustainable companies, environmentally responsible stocks and mutual funds that promote eco-friendly and socially conscious values. Honestly this has paid off for me much better (especially in the long term) than most of my other stock or mutual fund picks. I recently found and interesting investing tool called the Dow Jones Sustainability Index (DJSI), which are a collection of global indexes tracking the financial performance of the leading sustainability-driven companies worldwide. A partnership between the Dow Jones Dow Jones Indexes, STOXX Limited and SAM they provide asset managers benchmarks to manage sustainability portfolios. The nice thing is that you are able to access them as well for your investment decisions. You are able to look up companies and filter them by key factors outlined by the index. 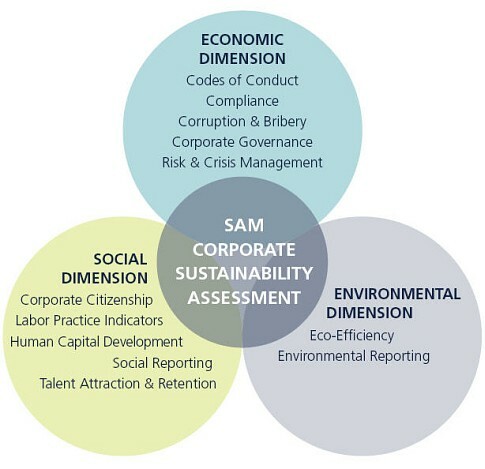 For each company, the input sources of information for the Corporate Sustainability Assessment consist of the responses to the online questionnaire, submitted documentation, policies and reports, publicly available information and SAM Research analyst’s direct contact with companies. Each sustainability assessment is verified by PricewaterhouseCoopers. It is a step in the right direction and lets companies know that we are interested in options that preserve the environment and mirror our values as eco-friendly investors and consumers, however, it is not THE solution. I have found that this tool works great as a filter, not as an decision maker. 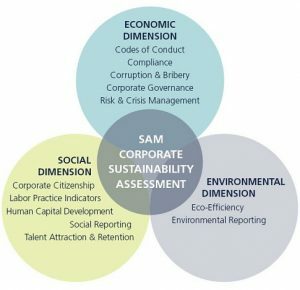 One may disagree with the sustainability index score weighting, or it may not accurately display the environmental stewardship of a company (or lack thereof) due to other factors. The reporting is done by the company and verified in a way that could be easily manipulated or falsified, so it too must be taken with a grain of salt. Since buying a stock is making an investment in much the same way buying a house is, think of this as a tool to finding the right neighborhood. You still want to scratch deeper to come to the right conclusion. I like your thoughts on sustainable investing. I have been following ethical/sustainable investing for about forty years and believe that when we invest in a company, or many companies in the case of a mutual fund, we share in the responsibility for the activities of those companies as well as participate in the outcomes of their corporate activities. So, anyone valuing their personal or spiritual growth has to take these things into account when investing.